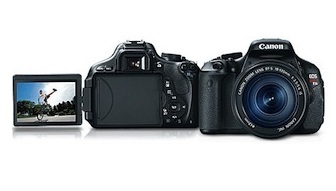 Looks like the T2i and the 60D had a baby…and they called it the T3i. The T3i/600D is the latest HDSLR from Canon. It promises upgraded features over the T2i along with some unique new features not found in any other Canon camera. The Video Snapshot feature enables the user to capture short video clips of 2, 4 or 8 seconds in length. These short snapshots are then stitched together into one file as a Video Snapshot Album, creating a dynamic, fast-paced movie sequence. You can reach distant subjects using new Movie Digital Zoom function, which crops the centre of the sensor from 3x to 10x while still maintaining Full HD quality – great for capturing wildlife on a safari holiday. I’m looking forward to seeing how the T3i fits in the Canon line up. Honestly, at this point I would still advise people to spring the extra couple hundred for the 60D to get a few more pro features. But if you want to keep your budget low, the T3i should be a great option. The T3i/600D is set to release sometime in March. Read more on Canon’s website.